CIFKM - How to organize CIFKM standard version in a company? 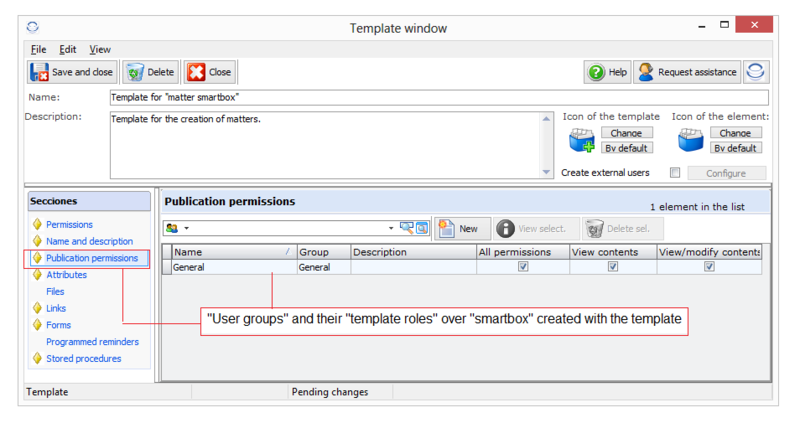 Basic concepts: "Items" and "Roles"
Creating a new "user group"
To configure the necessary "items": "User groups", "Smart Box templates", "Search templates", and "Attributes". 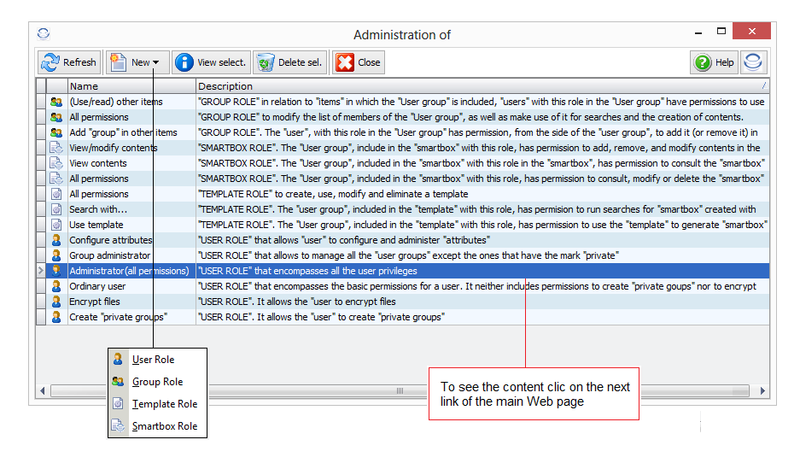 To include "user groups" into the other "items" over which they shall have powers to manage, and assign regarding each "item" the corresponding "role" or set of "roles" to its "user groups". 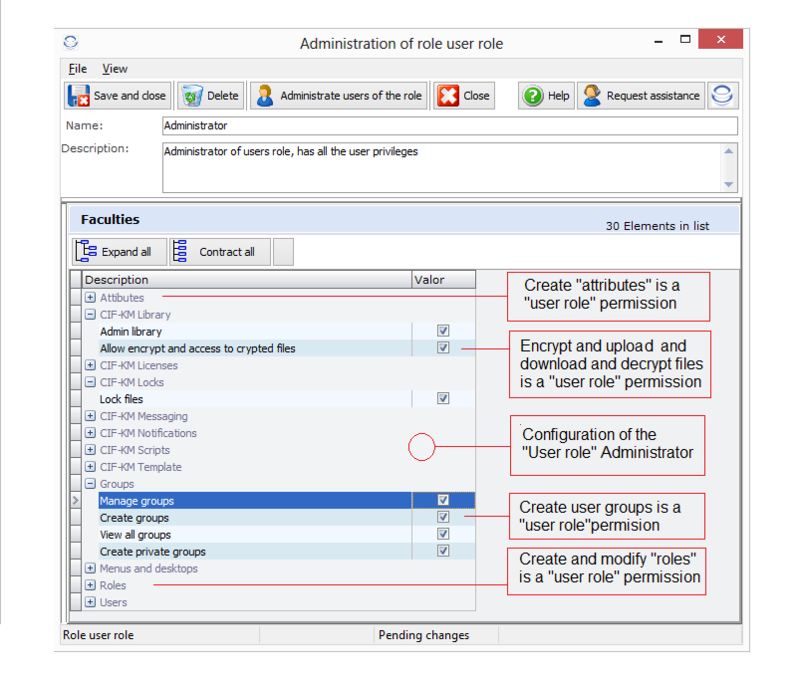 "Roles" are configurable sets of privileges that can be modified at any time. "User roles" are assigned to "users" to grant them privileges over the whole system; and "item roles" are assigned to "user groups" that are included in each "item" to grant them privileges over it. Any user, when registered is automatically assigned his "personal user group" in which he is the only member with all faculties. These personal groups have the same features as any ordinary "user group". Any "personal user group" can be nested in other "user groups" and these ones in others and so on. This possibility of nesting groups in other groups allows one to represent positions in the organizational chart which may be nested in other groups such as areas, committees,… when they have some responsibility or participation over them. 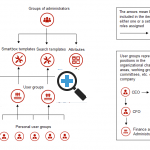 Thus, in any company's reorganization one will only have to substitute users in the affected positions of the organizational chart (represented by "group of users") maintaining the roles and faculties of the position. 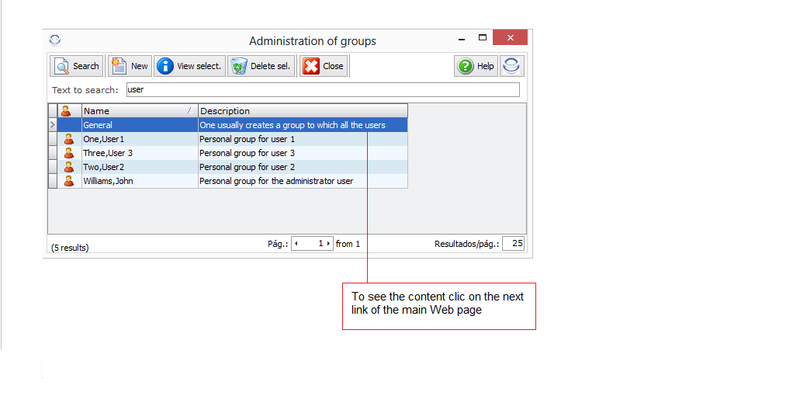 To view and manage "items, "User groups" are inserted in them, and one or several "roles" of the type from the "item" are granted to each "group". Initially we recommend that you start with the standard version configuration that may be downloaded from the website of CIFKM. 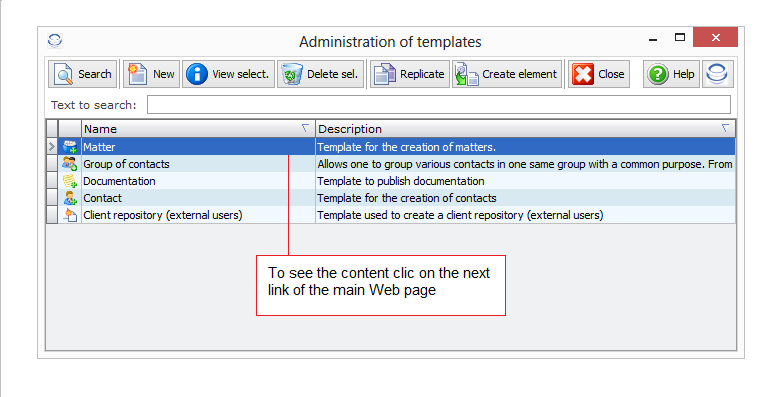 Administrators can view and become familiar with different configurations of items and roles at "Administration" from the menu of the floating Icon. 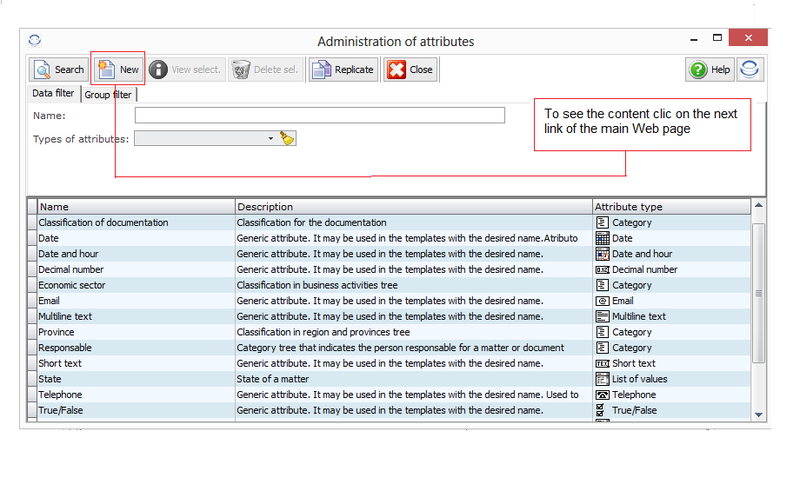 Attributes including in each of them "user groups" to determine who can view and use each attribute. You can configure the same attribute many times, for example, to record entries of documents in several areas of the company, assigning to each configuration different groups. Each "user group" will only see the corresponding configuration of the same attribute.Except for cases like the aforementioned, it is recommended that in all configurations of "attributes" one include the "general group" that includes all users of the company. So, they will all have visibility and can use all the attributes that may appear in any "Smart Box" regardless of whether or not the groups with permissions over this "Smart Box" are included in the "attributes". 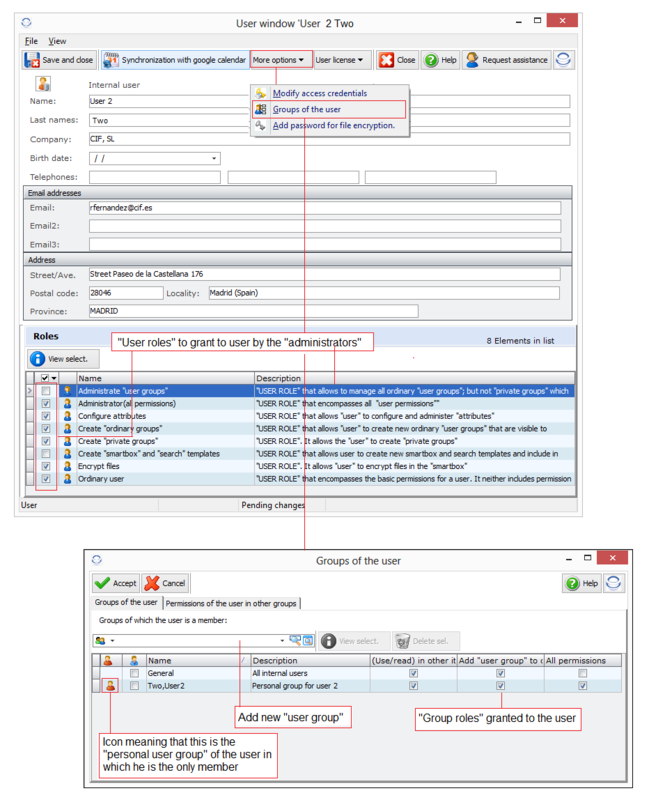 Templates of Data Smart Box and searches, including groups of users in them, assigning to them the appropriate template roles, and incorporating "attributes". You have to watch that the groups are also included in the configuration of the attributes, otherwise these will not be visible. 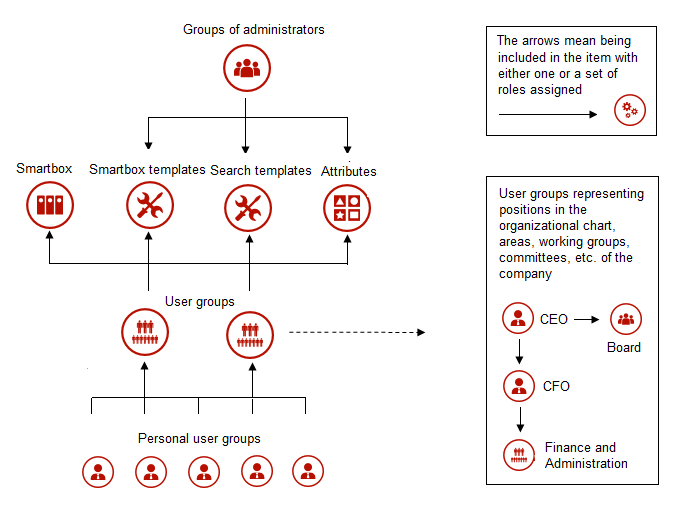 The latter is not necessary for "attribute" configurations with the general group included.In the templates there are two sections, related to "user group" permissions, that respectively configure: (1) user groups with "template roles" granting permissions over the "template" and (2) groups of users with Data Smart Box roles granting permissions over the Data Smart Boxes to be created with the template. They are separated because the groups of user in each setion do not have to coincide. 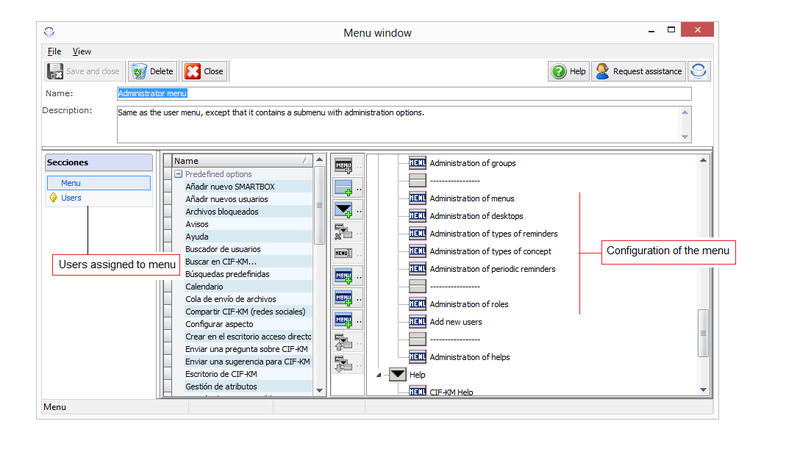 User menus that here are two types for each user: (1) the user menu that appears in the "floating icon" and in the CIFKM "desktop menu".These menus are configured and assigned to "users", otherwise those marked by default are assigned. The features shown in each of the two menus for the same "user" may be different. Assigning "user roles" to users which determine what the "user" can do in CIFKM, such as, to create new "user groups", to encrypt and decrypt files, to lock files temporarily meanwhile he is making changes in them, etc. 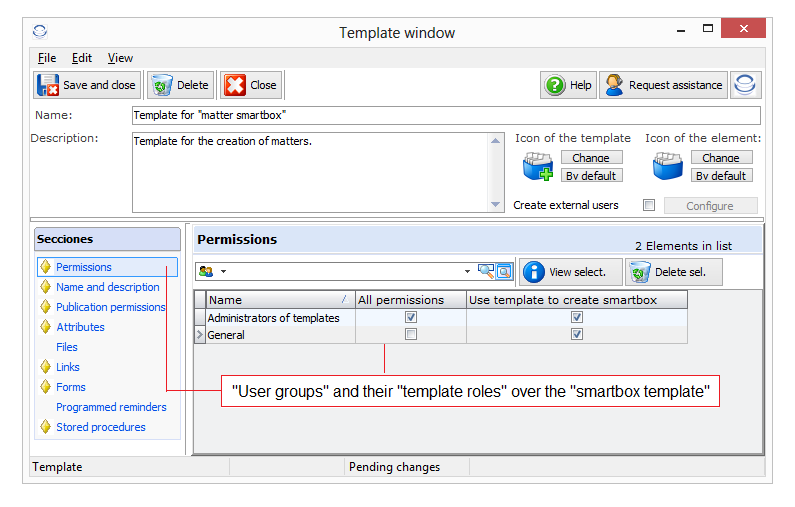 (1) - to include the group in the "Data Smart Box templates" and "search templates" over which the group shall have permissions and assign the appropriate "roles". 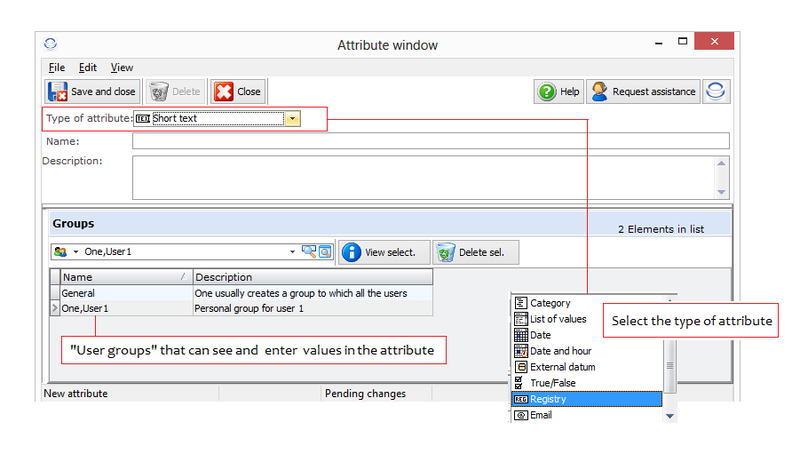 (2) - To include it in the configurations of "attributes" that should be visible and usable (value entry) for the "user group", unless they are already visible and usable by all users because the "general group" has been already included in all attribute configurations. 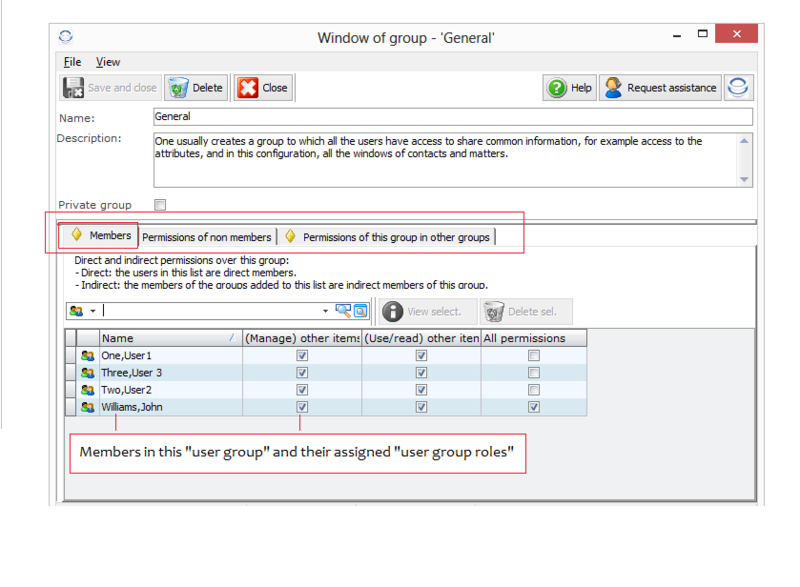 If the new "user group" should be included (nested) in another group, the "user" who creates it must have been granted the "role" of administrator in this other group, otherwise he will not have permission to include new members and assign "roles" over it. The members of the new "user group" will possess the permissions assigned to it over the other group. However, as mentioned before, "users" who are not qualified as members of the new "user group" though they may currently have assigned "group roles" over it, will neither be deemed members of the other group nor have permissions over it. To the new "user" administrators must: (1) assign him the appropriate "user roles", and... (2) include him in the appropriate "user groups". (See...... Assigning "user roles" and adding or removing "user groups" to a user from his "user card" by an "administrator") Otherwise, this new "user", although registered, wouldn't have faculties or permissions to act.